I have had an introspective week. I had intended to do a post on the happy changes I mentioned last week. But two pieces of bad news on top of a period where I have had losses in my family broke the camel’s back. In particular the news that a friend had taken his life hit me knocked the stuffing out of me. I had no idea he was struggling. No one had. News like that makes you re-evaluate everything. I wasn't going to post as I feel so sad. But then, I have got to be real, sadness is life, without it we would not know joy! Or perhaps we wouldn't prize it so much. The only art I did this week was this digital piece portraying how I feel at the moment. I used bit of art work and photos and collaged them in Photoshop. Have a great week and thanks for visiting, normal happy service will be back next week!! Linking as always to Paint Party Friday, thank you Eva and Kristin! Oh so sorry to hear about your hard week Sharon, that all sounds like shocking news, so take the time to heal inside and be gentle. Your digital piece is beautiful, take it easy and I hope the sunshine filters in your way soon again! Great digi painting Sharon- wishing the next week will get better for you and your art! So sorry about your friend and all the other shocking news. So sad the choices some people make. Wishing you well as you grieve. Your digital is very powerful and exudes your pensive feelings! Sending love your way! Sorry to read about your sad news. But good to see you can put your feelings into creative work. So beautiful colors in your digital work and in your blog! They help you in your grieve and to come over and further again. Yes, you are right, the grieve, sorrow is life too. Love your digital painting and hope the new week will bring some sun shine in your life. It is an interesting collection of experiences that make the fabric of our lives. So sorry about your loss Sharon. I love how you rationalized sadness with joy, so true. Glad you were able to post this beautiful digital collage. Sorry for your loss-such a tragic thing. I'm glad you posted because you can get support and love from us all via cyberspace. Your art, although a bit sad is full of hope with those beautiful Spring-like colors. 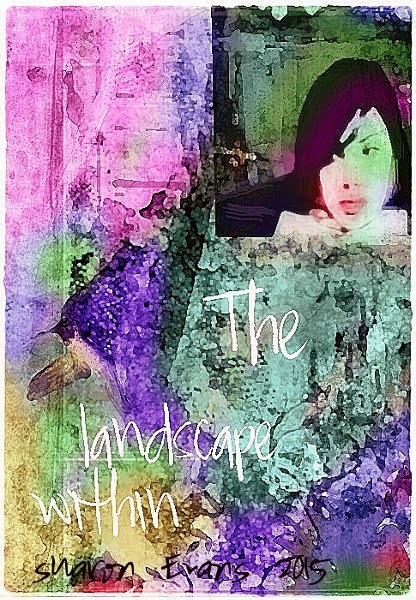 This image is wonderful, I love the idea of "the landscape within". You did a beautiful job. If so inclined I'd love you to share over on my site. So sorry to hear about your friend. It is very sad when New Year comes around and you hear of people who just can't seem to face another year. I am glad to hear that your artwork has seen you through tough times in the past and I'm sure it will do again. HUgs of comfort to you, sorry to hear about what happened, wishing peace and love to him and all who loved him. yes we often do not know the hidden struggle of others. Your art is beautifully expressed..very special. Wishing you much love in your time of need. You've made a lovely pensive piece here, really well done with the merged colours, the thoughtful lady and the words. Sending best wishes and hugs from Scotland. I am so sorry to hear about your friend. I think you have really expressed that sadness in your piece. Hug and smiles...do something good for yourself to keep your spirits up...even if its a big cup of tea or coffee! I really like your introspective art piece. I'm also very sorry to hear about the tragic loss of your friend. May the Lord keep him in eternal peace and give you the strength as you move on. And you are right, we see the beauty and the light better, when we have also seen darkness. Wishing you all the best and that you will get along well, work yourself through whatever it is! So sorry to hear the heartbreaking news for you. Your art is beautiful.